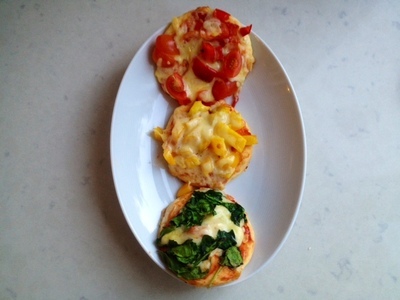 These yummy mini pizzas are a great way for kids to get creative in the kitchen. 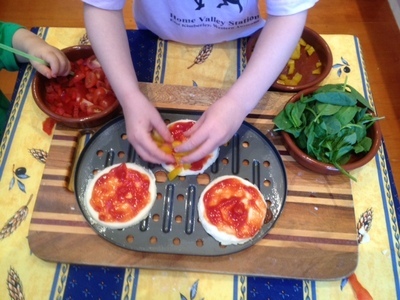 The process is really simple and the pizzas cook in 10 minutes, so it's a great project for even the youngest kids. Earlier in the day, we talked about how we might want to decorate the pizzas - e.g. make faces, make patterns with different toppings etc. My daughter settled on traffic light pizzas. 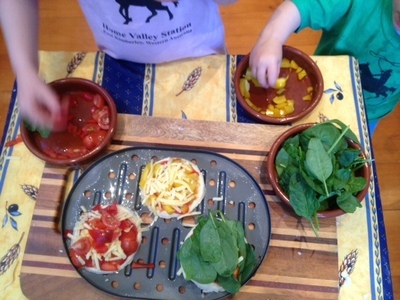 We went shopping and picked out red, yellow and green vegetables together to top our pizzas with. 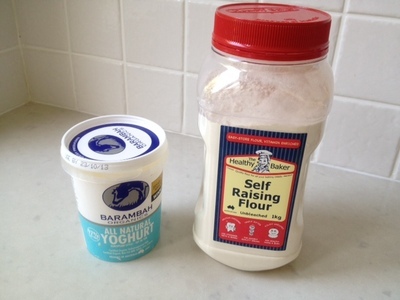 Spoon the yoghurt into a bowl. 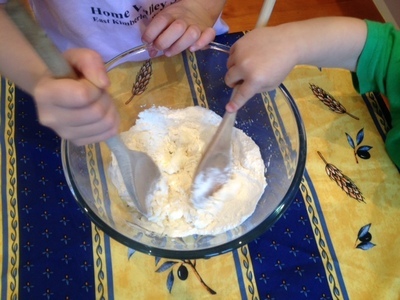 Add the flour slowly, mixing with a spoon or hands. 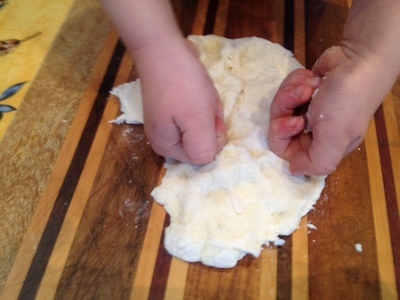 You want to get to a bread dough consistency so add the flour slowly and stop when it looks good. Add more flour if the mix is too wet. 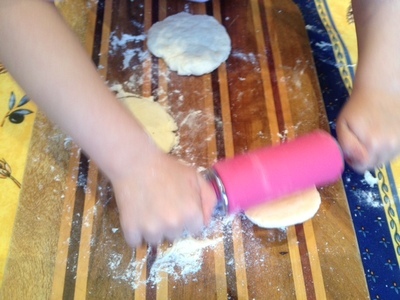 Split into three balls and roll flat on a floured surface. 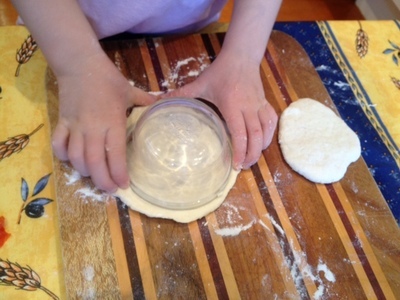 Use a cup or dish to cut out a neat circle. The final pizza base should be around half a centimetre thick. Set out the chopped toppings next to the pizza bases. 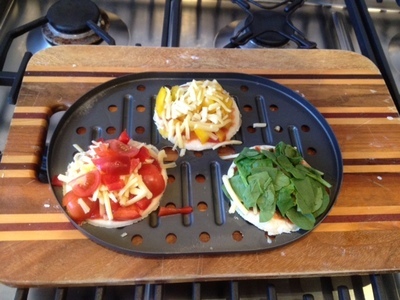 The idea is that the kids can easily choose the toppings and have fun arranging them on the pizza bases. Spread the tomato passata onto each pizza base. Sprinkle cheese onto the tomato paste. 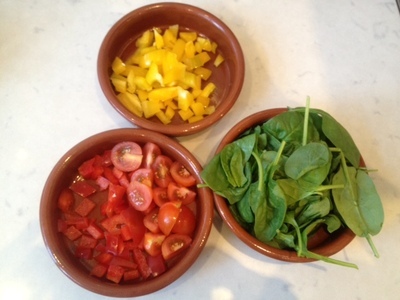 Add yellow toppings to one base, red toppings to another and green toppings to the third. Sprinkle a little extra cheese on top. Put onto a greased baking or pizza tray. Bake in the oven at 200 degrees or until the cheese has melted. Enjoy! Please share a picture of your creations via the comments forum.